This section only applies to user agents, data mining tools, and conformance checkers. The rules for parsing XML documents into DOM trees are covered by the next section, entitled "The XHTML syntax". For HTML documents, user agents must use the parsing rules described in this section to generate the DOM trees. Together, these rules define what is referred to as the HTML parser. While the HTML syntax described in this specification bears a close resemblance to SGML and XML, it is a separate language with its own parsing rules. Some earlier versions of HTML (in particular from HTML2 to HTML4) were based on SGML and used SGML parsing rules. However, few (if any) web browsers ever implemented true SGML parsing for HTML documents; the only user agents to strictly handle HTML as an SGML application have historically been validators. The resulting confusion — with validators claiming documents to have one representation while widely deployed Web browsers interoperably implemented a different representation — has wasted decades of productivity. This version of HTML thus returns to a non-SGML basis. Authors interested in using SGML tools in their authoring pipeline are encouraged to use XML tools and the XML serialization of HTML. This specification defines the parsing rules for HTML documents, whether they are syntactically correct or not. Certain points in the parsing algorithm are said to be parse errors. The error handling for parse errors is well-defined: user agents must either act as described below when encountering such problems, or must abort processing at the first error that they encounter for which they do not wish to apply the rules described below. Conformance checkers must report at least one parse error condition to the user if one or more parse error conditions exist in the document and must not report parse error conditions if none exist in the document. Conformance checkers may report more than one parse error condition if more than one parse error condition exists in the document. Conformance checkers are not required to recover from parse errors. Parse errors are only errors with the syntax of HTML. In addition to checking for parse errors, conformance checkers will also verify that the document obeys all the other conformance requirements described in this specification. For the purposes of conformance checkers, if a resource is determined to be in the HTML syntax, then it is an HTML document. The input to the HTML parsing process consists of a stream of Unicode characters, which is passed through a tokenization stage followed by a tree construction stage. The output is a Document object. Implementations that do not support scripting do not have to actually create a DOM Document object, but the DOM tree in such cases is still used as the model for the rest of the specification. In the common case, the data handled by the tokenization stage comes from the network, but it can also come from script running in the user agent, e.g. using the document.write() API. 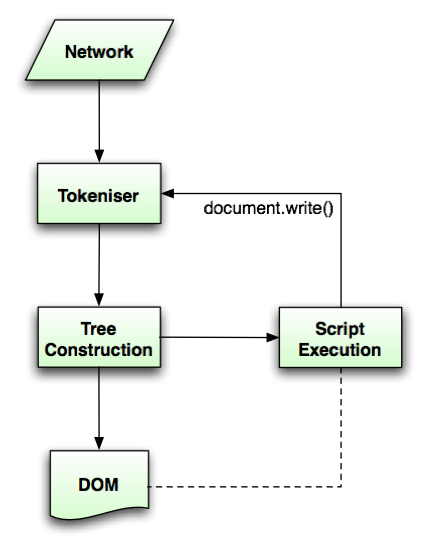 There is only one set of states for the tokenizer stage and the tree construction stage, but the tree construction stage is reentrant, meaning that while the tree construction stage is handling one token, the tokenizer might be resumed, causing further tokens to be emitted and processed before the first token's processing is complete. To handle these cases, parsers have a script nesting level, which must be initially set to zero, and a parser pause flag, which must be initially set to false. The stream of Unicode characters that comprises the input to the tokenization stage will be initially seen by the user agent as a stream of bytes (typically coming over the network or from the local file system). The bytes encode the actual characters according to a particular character encoding, which the user agent must use to decode the bytes into characters. In some cases, it might be impractical to unambiguously determine the encoding before parsing the document. Because of this, this specification provides for a two-pass mechanism with an optional pre-scan. Implementations are allowed, as described below, to apply a simplified parsing algorithm to whatever bytes they have available before beginning to parse the document. Then, the real parser is started, using a tentative encoding derived from this pre-parse and other out-of-band metadata. If, while the document is being loaded, the user agent discovers an encoding declaration that conflicts with this information, then the parser can get reinvoked to perform a parse of the document with the real encoding. User agents must use the following algorithm (the encoding sniffing algorithm) to determine the character encoding to use when decoding a document in the first pass. This algorithm takes as input any out-of-band metadata available to the user agent (e.g. the Content-Type metadata of the document) and all the bytes available so far, and returns an encoding and a confidence. The confidence is either tentative, certain, or irrelevant. The encoding used, and whether the confidence in that encoding is tentative or certain, is used during the parsing to determine whether to change the encoding. If no encoding is necessary, e.g. because the parser is operating on a stream of Unicode characters and doesn't have to use an encoding at all, then the confidence is irrelevant. If the user has explicitly instructed the user agent to override the document's character encoding with a specific encoding, optionally return that encoding with the confidence certain and abort these steps. If the transport layer specifies an encoding, and it is supported, return that encoding with the confidence certain, and abort these steps. The user agent may wait for more bytes of the resource to be available, either in this step or at any later step in this algorithm. For instance, a user agent might wait 500ms or 512 bytes, whichever came first. In general preparsing the source to find the encoding improves performance, as it reduces the need to throw away the data structures used when parsing upon finding the encoding information. However, if the user agent delays too long to obtain data to determine the encoding, then the cost of the delay could outweigh any performance improvements from the preparse. Let position be a pointer to a byte in the input stream, initially pointing at the first byte. If at any point during these substeps the user agent either runs out of bytes or decides that scanning further bytes would not be efficient, then skip to the next step of the overall character encoding detection algorithm. User agents may decide that scanning any bytes is not efficient, in which case these substeps are entirely skipped. Advance the position pointer so that it points at the next 0x09, 0x0A, 0x0C, 0x0D, 0x20, or 0x2F byte (the one in sequence of characters matched above). Let attribute list be an empty list of strings. Let got pragma be false. Let charset be the null value (which, for the purposes of this algorithm, is distinct from an unrecognised encoding or the empty string). Attributes: Get an attribute and its value. If no attribute was sniffed, then jump to the processing step below. If the attribute's name is already in attribute list, then return to the step labeled attributes. If the attribute's name is "http-equiv"
If the attribute's value is "content-type", then set got pragma to true. If the attribute's name is "charset"
If charset is still set to null, let charset be the encoding corresponding to the attribute's value, and set mode to "charset". If the attribute's name is "content"
Apply the algorithm for extracting an encoding from a Content-Type, giving the attribute's value as the string to parse. If an encoding is returned, and if charset is still set to null, let charset be the encoding returned, and set mode to "pragma". Return to the step labeled attributes. Processing: If mode is null, then jump to the second step of the overall "two step" algorithm. If mode is "pragma" but got pragma is false, then jump to the second step of the overall "two step" algorithm. If charset is a UTF-16 encoding, change the value of charset to UTF-8. If charset is not a supported character encoding, then jump to the second step of the overall "two step" algorithm. Return the encoding given by charset, with confidence tentative, and abort all these steps. Advance the position pointer so that it points at the next 0x09 (ASCII TAB), 0x0A (ASCII LF), 0x0C (ASCII FF), 0x0D (ASCII CR), 0x20 (ASCII space), or 0x3E (ASCII >) byte. Repeatedly get an attribute until no further attributes can be found, then jump to the second step in the overall "two step" algorithm. Advance the position pointer so that it points at the first 0x3E byte (ASCII >) that comes after the 0x3C byte that was found. Do nothing with that byte. Move position so it points at the next byte in the input stream, and return to the first step of this "two step" algorithm. If the byte at position is one of 0x09 (ASCII TAB), 0x0A (ASCII LF), 0x0C (ASCII FF), 0x0D (ASCII CR), 0x20 (ASCII space), or 0x2F (ASCII /) then advance position to the next byte and redo this substep. If the byte at position is 0x3E (ASCII >), then abort the "get an attribute" algorithm. There isn't one. Otherwise, the byte at position is the start of the attribute name. Let attribute name and attribute value be the empty string. Advance position to the next byte and jump to the step below labeled value. Jump to the step below labeled spaces. Abort the "get an attribute" algorithm. The attribute's name is the value of attribute name, its value is the empty string. Append the Unicode character with code point b+0x20 to attribute name (where b is the value of the byte at position). Advance position to the next byte and return to the previous step. Spaces: If the byte at position is one of 0x09 (ASCII TAB), 0x0A (ASCII LF), 0x0C (ASCII FF), 0x0D (ASCII CR), or 0x20 (ASCII space) then advance position to the next byte, then, repeat this step. If the byte at position is not 0x3D (ASCII =), abort the "get an attribute" algorithm. The attribute's name is the value of attribute name, its value is the empty string. Advance position past the 0x3D (ASCII =) byte. Value: If the byte at position is one of 0x09 (ASCII TAB), 0x0A (ASCII LF), 0x0C (ASCII FF), 0x0D (ASCII CR), or 0x20 (ASCII space) then advance position to the next byte, then, repeat this step. Let b be the value of the byte at position. Advance position to the next byte. If the value of the byte at position is the value of b, then advance position to the next byte and abort the "get an attribute" algorithm. The attribute's name is the value of attribute name, and its value is the value of attribute value. Otherwise, if the value of the byte at position is in the range 0x41 (ASCII A) to 0x5A (ASCII Z), then append a Unicode character to attribute value whose code point is 0x20 more than the value of the byte at position. Otherwise, append a Unicode character to attribute value whose code point is the same as the value of the byte at position. Return to the second step in these substeps. Append the Unicode character with code point b+0x20 to attribute value (where b is the value of the byte at position). Advance position to the next byte. Append the Unicode character with the same code point as the value of the byte at position) to attribute value. Advance position to the next byte. Abort the "get an attribute" algorithm. The attribute's name is the value of attribute name and its value is the value of attribute value. Append the Unicode character with code point b+0x20 to attribute value (where b is the value of the byte at position). Append the Unicode character with the same code point as the value of the byte at position) to attribute value. If the user agent has information on the likely encoding for this page, e.g. based on the encoding of the page when it was last visited, then return that encoding, with the confidence tentative, and abort these steps. Otherwise, return an implementation-defined or user-specified default character encoding, with the confidence tentative. In controlled environments or in environments where the encoding of documents can be prescribed (for example, for user agents intended for dedicated use in new networks), the comprehensive UTF-8 encoding is suggested. The document's character encoding must immediately be set to the value returned from this algorithm, at the same time as the user agent uses the returned value to select the decoder to use for the input stream. It is not unusual for Web browsers to support dozens if not upwards of a hundred distinct character encodings. When comparing a string specifying a character encoding with the name or alias of a character encoding to determine if they are equal, user agents must remove any leading or trailing space characters in both names, and then perform the comparison in an ASCII case-insensitive manner. When a user agent would otherwise use an encoding given in the first column of the following table to either convert content to Unicode characters or convert Unicode characters to bytes, it must instead use the encoding given in the cell in the second column of the same row. When a byte or sequence of bytes is treated differently due to this encoding aliasing, it is said to have been misinterpreted for compatibility. When a user agent is to use the UTF-16 encoding but no BOM has been found, user agents must default to UTF-16LE. Support for encodings based on EBCDIC is not recommended. This encoding is rarely used for publicly-facing Web content. Support for UTF-32 is not recommended. This encoding is rarely used, and frequently implemented incorrectly. This specification does not make any attempt to support EBCDIC-based encodings and UTF-32 in its algorithms; support and use of these encodings can thus lead to unexpected behavior in implementations of this specification. Given an encoding, the bytes in the input stream must be converted to Unicode characters for the tokenizer, as described by the rules for that encoding, except that the leading U+FEFF BYTE ORDER MARK character, if any, must not be stripped by the encoding layer (it is stripped by the rule below). Bytes or sequences of bytes in the original byte stream that could not be converted to Unicode code points must be converted to U+FFFD REPLACEMENT CHARACTERs. Specifically, if the encoding is UTF-8, the bytes must be decoded with the error handling defined in this specification. Bytes or sequences of bytes in the original byte stream that did not conform to the encoding specification (e.g. invalid UTF-8 byte sequences in a UTF-8 input stream) are errors that conformance checkers are expected to report. Any byte or sequence of bytes in the original byte stream that is misinterpreted for compatibility is a parse error. The requirement to strip a U+FEFF BYTE ORDER MARK character regardless of whether that character was used to determine the byte order is a willful violation of Unicode, motivated by a desire to increase the resilience of user agents in the face of naïve transcoders. All U+0000 NULL characters and code points in the range U+D800 to U+DFFF in the input must be replaced by U+FFFD REPLACEMENT CHARACTERs. Any occurrences of such characters and code points are parse errors. Any occurrences of any characters in the ranges U+0001 to U+0008, U+000E to U+001F, U+007F to U+009F, U+FDD0 to U+FDEF, and characters U+000B, U+FFFE, U+FFFF, U+1FFFE, U+1FFFF, U+2FFFE, U+2FFFF, U+3FFFE, U+3FFFF, U+4FFFE, U+4FFFF, U+5FFFE, U+5FFFF, U+6FFFE, U+6FFFF, U+7FFFE, U+7FFFF, U+8FFFE, U+8FFFF, U+9FFFE, U+9FFFF, U+AFFFE, U+AFFFF, U+BFFFE, U+BFFFF, U+CFFFE, U+CFFFF, U+DFFFE, U+DFFFF, U+EFFFE, U+EFFFF, U+FFFFE, U+FFFFF, U+10FFFE, and U+10FFFF are parse errors. These are all control characters or permanently undefined Unicode characters (noncharacters). U+000D CARRIAGE RETURN (CR) characters and U+000A LINE FEED (LF) characters are treated specially. Any CR characters that are followed by LF characters must be removed, and any CR characters not followed by LF characters must be converted to LF characters. Thus, newlines in HTML DOMs are represented by LF characters, and there are never any CR characters in the input to the tokenization stage. The next input character is the first character in the input stream that has not yet been consumed. Initially, the next input character is the first character in the input. The current input character is the last character to have been consumed. The insertion point is the position (just before a character or just before the end of the input stream) where content inserted using document.write() is actually inserted. The insertion point is relative to the position of the character immediately after it, it is not an absolute offset into the input stream. Initially, the insertion point is undefined. The "EOF" character in the tables below is a conceptual character representing the end of the input stream. If the parser is a script-created parser, then the end of the input stream is reached when an explicit "EOF" character (inserted by the document.close() method) is consumed. Otherwise, the "EOF" character is not a real character in the stream, but rather the lack of any further characters. When the parser requires the user agent to change the encoding, it must run the following steps. This might happen if the encoding sniffing algorithm described above failed to find an encoding, or if it found an encoding that was not the actual encoding of the file. If the new encoding is identical or equivalent to the encoding that is already being used to interpret the input stream, then set the confidence to certain and abort these steps. This happens when the encoding information found in the file matches what the encoding sniffing algorithm determined to be the encoding, and in the second pass through the parser if the first pass found that the encoding sniffing algorithm described in the earlier section failed to find the right encoding. If the encoding that is already being used to interpret the input stream is a UTF-16 encoding, then set the confidence to certain and abort these steps. The new encoding is ignored; if it was anything but the same encoding, then it would be clearly incorrect. If all the bytes up to the last byte converted by the current decoder have the same Unicode interpretations in both the current encoding and the new encoding, and if the user agent supports changing the converter on the fly, then the user agent may change to the new converter for the encoding on the fly. Set the document's character encoding and the encoding used to convert the input stream to the new encoding, set the confidence to certain, and abort these steps. Otherwise, navigate to the document again, with replacement enabled, and using the same source browsing context, but this time skip the encoding sniffing algorithm and instead just set the encoding to the new encoding and the confidence to certain. Whenever possible, this should be done without actually contacting the network layer (the bytes should be re-parsed from memory), even if, e.g., the document is marked as not being cacheable. If this is not possible and contacting the network layer would involve repeating a request that uses a method other than HTTP GET (or equivalent for non-HTTP URLs), then instead set the confidence to certain and ignore the new encoding. The resource will be misinterpreted. User agents may notify the user of the situation, to aid in application development. The insertion mode is a state variable that controls the primary operation of the tree construction stage. Initially, the insertion mode is "initial". It can change to "before html", "before head", "in head", "in head noscript", "after head", "in body", "text", "in table", "in table text", "in caption", "in column group", "in table body", "in row", "in cell", "in select", "in select in table", "in foreign content", "after body", "in frameset", "after frameset", "after after body", and "after after frameset" during the course of the parsing, as described in the tree construction stage. The insertion mode affects how tokens are processed and whether CDATA sections are supported. Several of these modes, namely "in head", "in body", "in table", and "in select", are special, in that the other modes defer to them at various times. When the algorithm below says that the user agent is to do something "using the rules for the m insertion mode", where m is one of these modes, the user agent must use the rules described under the m insertion mode's section, but must leave the insertion mode unchanged unless the rules in m themselves switch the insertion mode to a new value. When the insertion mode is switched to "text" or "in table text", the original insertion mode is also set. This is the insertion mode to which the tree construction stage will return. Let node be the last node in the stack of open elements. If node is a td or th element and last is false, then switch the insertion mode to "in cell" and abort these steps. If node is a tr element, then switch the insertion mode to "in row" and abort these steps. If node is a tbody, thead, or tfoot element, then switch the insertion mode to "in table body" and abort these steps. If node is a caption element, then switch the insertion mode to "in caption" and abort these steps. If node is a table element, then switch the insertion mode to "in table" and abort these steps. If node is a body element, then switch the insertion mode to "in body" and abort these steps. If node is an element from the MathML namespace or the SVG namespace, then switch the insertion mode to "in foreign content" and abort these steps. Let node now be the node before node in the stack of open elements. Initially, the stack of open elements is empty. The stack grows downwards; the topmost node on the stack is the first one added to the stack, and the bottommost node of the stack is the most recently added node in the stack (notwithstanding when the stack is manipulated in a random access fashion as part of the handling for misnested tags). The "before html" insertion mode creates the html root element node, which is then added to the stack. The html node, however it is created, is the topmost node of the stack. It only gets popped off the stack when the parser finishes. The current node is the bottommost node in this stack. The current table is the last table element in the stack of open elements, if there is one. If there is no table element in the stack of open elements (fragment case), then the current table is the first element in the stack of open elements (the html element). The following elements have varying levels of special parsing rules: HTML's address, applet, area, article, aside, base, basefont, bgsound, blockquote, body, br, button, caption, center, col, colgroup, command, dd, details, dir, div, dl, dt, embed, fieldset, figcaption, figure, footer, form, frame, frameset, h1, h2, h3, h4, h5, h6, head, header, hgroup, hr, html, iframe, img, input, isindex, li, link, listing, marquee, menu, meta, nav, noembed, noframes, noscript, object, ol, p, param, plaintext, pre, script, section, select, style, summary, table, tbody, td, textarea, tfoot, th, thead, title, tr, ul, wbr, and xmp; MathML's mi, mo, mn, ms, mtext, and annotation-xml; and SVG's foreignObject, desc, and title. The following HTML elements are those that end up in the list of active formatting elements: a, b, big, code, em, font, i, nobr, s, small, strike, strong, tt, and u. All other elements found while parsing an HTML document. Initialize node to be the current node (the bottommost node of the stack). If node is the target node, terminate in a match state. Otherwise, if node is one of the element types in list, terminate in a failure state. All the element types listed above for the has an element in scope algorithm. Nothing happens if at any time any of the elements in the stack of open elements are moved to a new location in, or removed from, the Document tree. In particular, the stack is not changed in this situation. This can cause, amongst other strange effects, content to be appended to nodes that are no longer in the DOM. In some cases (namely, when closing misnested formatting elements), the stack is manipulated in a random-access fashion. Initially, the list of active formatting elements is empty. It is used to handle mis-nested formatting element tags. The list contains elements in the formatting category, and scope markers. The scope markers are inserted when entering applet elements, buttons, object elements, marquees, table cells, and table captions, and are used to prevent formatting from "leaking" into applet elements, buttons, object elements, marquees, and tables. The scope markers are unrelated to the concept of an element being in scope. In addition, each element in the list of active formatting elements is associated with the token for which it was created, so that further elements can be created for that token if necessary. If there are no entries in the list of active formatting elements, then there is nothing to reconstruct; stop this algorithm. If the last (most recently added) entry in the list of active formatting elements is a marker, or if it is an element that is in the stack of open elements, then there is nothing to reconstruct; stop this algorithm. Let entry be the last (most recently added) element in the list of active formatting elements. If there are no entries before entry in the list of active formatting elements, then jump to step 8. Let entry be the entry one earlier than entry in the list of active formatting elements. If entry is neither a marker nor an element that is also in the stack of open elements, go to step 4. Let entry be the element one later than entry in the list of active formatting elements. Create an element for the token for which the element entry was created, to obtain new element. Append new element to the current node and push it onto the stack of open elements so that it is the new current node. Replace the entry for entry in the list with an entry for new element. If the entry for new element in the list of active formatting elements is not the last entry in the list, return to step 7. This has the effect of reopening all the formatting elements that were opened in the current body, cell, or caption (whichever is youngest) that haven't been explicitly closed. The way this specification is written, the list of active formatting elements always consists of elements in chronological order with the least recently added element first and the most recently added element last (except for while steps 8 to 11 of the above algorithm are being executed, of course). Let entry be the last (most recently added) entry in the list of active formatting elements. Remove entry from the list of active formatting elements. If entry was a marker, then stop the algorithm at this point. The list has been cleared up to the last marker. Initially, the head element pointer and the form element pointer are both null. Once a head element has been parsed (whether implicitly or explicitly) the head element pointer gets set to point to this node. The form element pointer points to the last form element that was opened and whose end tag has not yet been seen. It is used to make form controls associate with forms in the face of dramatically bad markup, for historical reasons. The scripting flag is set to "enabled" if scripting was enabled for the Document with which the parser is associated when the parser was created, and "disabled" otherwise. The scripting flag can be enabled even when the parser was originally created for the HTML fragment parsing algorithm, even though script elements don't execute in that case. The frameset-ok flag is set to "ok" when the parser is created. It is set to "not ok" after certain tokens are seen.